All of us suffer from something–usually multiple issues–at any given time. We may need physical healing, mental healing, a new job, restored relationships, financial stability, or any other relief from suffering. No matter what needs healing, Jesus Christ has the power to deliver us. He may touch us directly, or He might use other people or resources to provide for our needs. The sick man answered Him, “Sir, I have no man to put me into the pool when the water is stirred up; but while I am coming, another steps down before me (John 5:6-7 NKJV). Jesus actually asks the man if he wants to get well! He knew that he had been in that condition for almost four decades. Somehow other paralyzed, lame, and blind people made it into the well–but this guy never did. And when Jesus asked the man if he wanted to be made well, he did not give him a clear yes or no. He told Jesus that no one was there to help him. God wants to help you, but he also wants you to reach out for help. 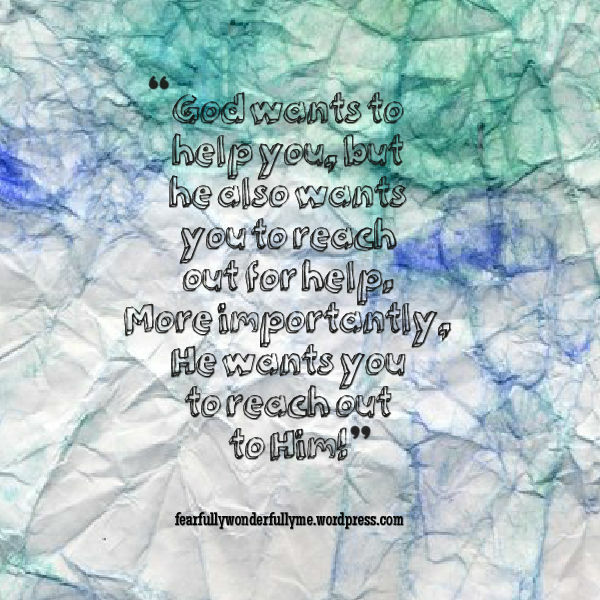 More importantly, He wants you to reach out to Him! Even when it feels like there is no one there for you, God always is. And sometimes, He wants you to take the initiative. Sometimes it can be easy to just sit around and wallow by the pool of our pain and suffering like this guy did. We all want people to help us, but sometimes we can take them for granted. We have to remember that while God is in charge and is the director of our lives, He has made us stewards of our own lives. We are not mindless puppets. We have free will, and with this free will we can take the initiative to seek God and the resources He gives us to clean up our lives. Don’t be passive. It’s easy to try a little and then give up by the pool because no one is there to lift us up. But we need to keep moving forward and trying our hardest to keep changing and growing in Christ. Through God’s strength and grace we can dive into His living waters and find healing. Fearfully Wonderfully Me continually writes great posts that remind me of my need for God. This post hits close to home for some of the things I have been praying for myself as well as for others.